Is this the photo of a real Martian? Is a Bigfoot? Is it some other form of alien life? Is it a rock? Nobody knows! According to NASA this photo was taken by the Intrepid Spirit Rover on the edge of Mars’ Gusev crater back in November of 2004. 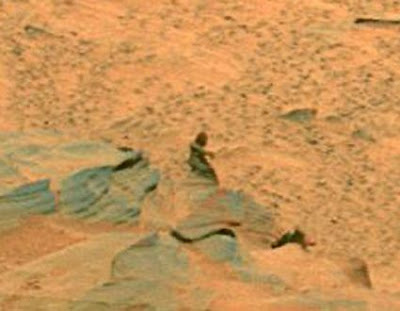 The image appears to show a human-like figure climbing down a rocky slope. NASA, however, hasn't made any comment on the image which was posted on their website Wednesday. Apparently the British media went nuts when the image became public, suggesting that it was proof of life on Mars. A lot of people have been coming forward with their opinion of just what they think is in the image. Some say it's Bigfoot, some say a Wookiee, others see a naked green woman. I just happen to think it looks like a Tusken Raider. Whatever it is, it makes for great conversation. Hey, the next thing you know, Philip Morris will be on TV claiming that he made a "Neanderthal" costume for NASA.